A wideopen region of vast grasslands and rolling mountains, Zekog/Zeku has little in the way of ‘attractions’ aside from the scenery and nomad culture. In the distant reaches of the county, however, lie several intriguing monasteries, and beautiful grasslands and mountains await wherever you go. The 3700-meter-high county town, where you’ll inevitably end up, is your classic chaotic nomad trading post dropped unceremoniously amidst the grasslands. At one end of town is a grassy rise liberally covered in prayer flags, around which locals are constantly circumambulating. 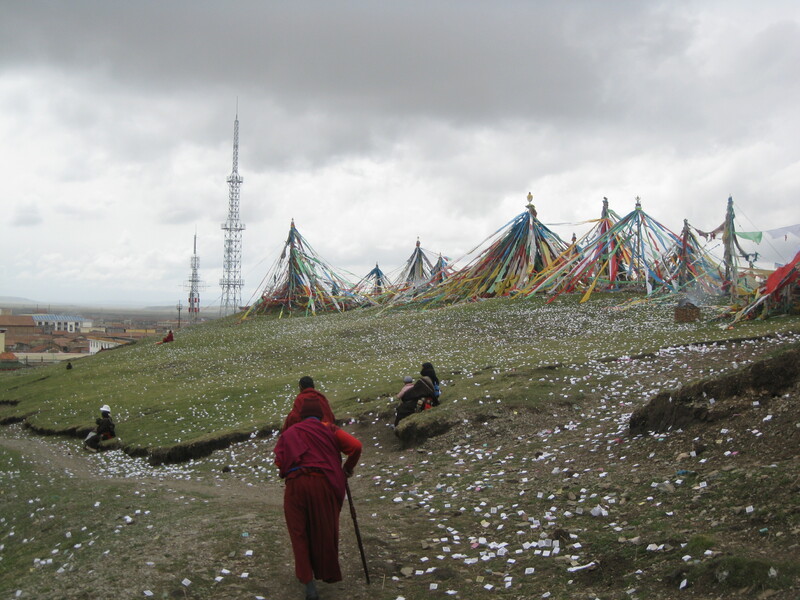 This is Jyidpori, or “Happy Mountain”, atop which a brand-new monastery overlooks the Ze-chu རྩེ་ཆུ། (泽曲) or “River of Love” flowing languidly across the grasslands. 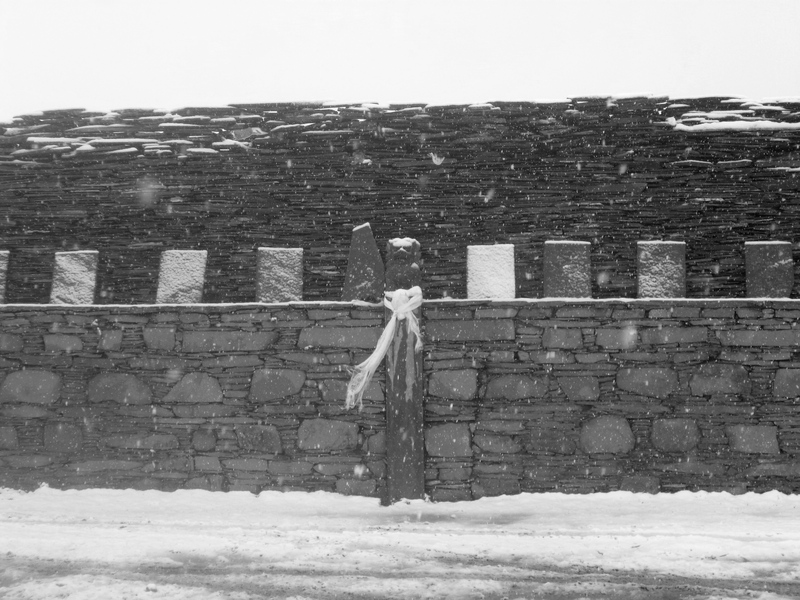 This is the place to come to make something happen…but not in the winter, when temperatures regularly fall below -40C. Transportation in Zekog/Zeku is easy, with buses and minivans to nearly every destination of importance (or unimportance) available at the bus station, at the nearby crossroads (50m down the street), or somewhere in between. 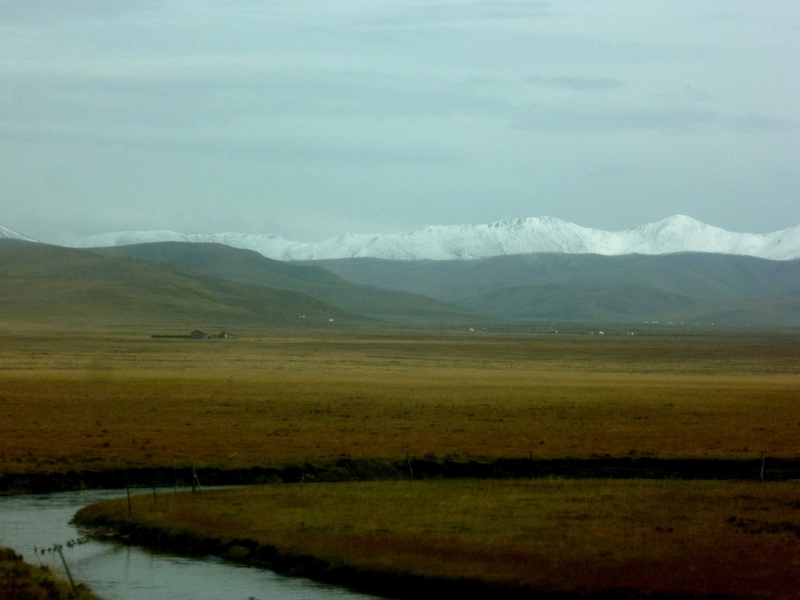 Buses run to Xining, Rebgong, Linxia 临夏 (in Gansu) and – conveniently – Maqen 玛沁 རྨ་ཆེན། (Dawu 大武 ཏ་བོར།) in Golog མགོ་ལོག། 果洛 prefecture. The majority of the hotels Tsekog/Zeku county town are located down side alleyways near the bus station; though the access may seem sketchy, the hotels are clean, comfortable, and warm; given the region’s frigid climate, most rooms are equipped with yak-dung stoves! As for restaurants, there are many near the main crossroads; particularly good is one Sichuan place (close to the centrally-located baozi restaurant) which serves a fantastic 孜然羊肉 ziran yangrou, or cumin mutton. Make sure you try the mutton and yogurt in this region, both of which are justifiably famous. Out of town: Lots of beautiful grasslands and mountains await. Always bring warm clothes, though – it never gets hot here, and snow can occur any time of year. This is a great region to bike-tour or simply wander down an open road. 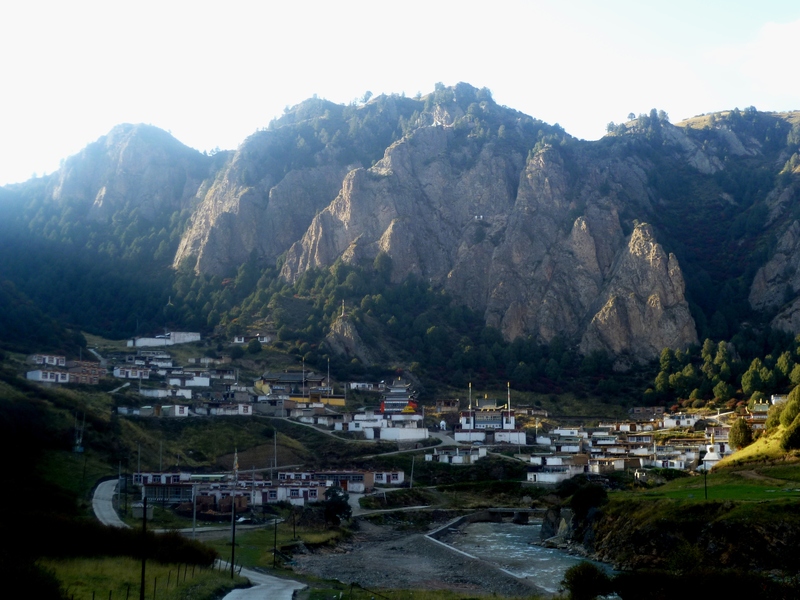 Monasteries: Tucked into a narrow, rocky ravine below rounded hills, Hor Monastery ཧོར་དགོན་པ། 和日寺院 is a monastic center for the grasslands of western Tsekog county. On a hilltop above the monastery lie the famous Hor mani walls, which contain (it is said) a complete copy of the Tibetan Buddhist canon carved in stone! Other monasteries worth visiting include Dzongmar Gonpa རྫོང་མར་དགོན་པ། (mentioned above in the Maixiu Forest Park section) and Dorjedzong Gonpa རྡོ་རྗེ་རྫོང་དགོན་པ། – which is located in an undisclosed location deep within a spectacularly remote forested gorge. Western Zekog (Hor, Ningxiu, etc. ): There’s not all that much here, but that’s part of the charm. Of the two roads from the county town to Hor, the north road has the better scenery and taller mountains, though both pass through some beautiful nomadic grassland areas (and the south road passes by a very active horse-race ‘track’). In western Zekog (Hor/Ningxiu area), consider staying at the random and unnamed but quite comfortable hotel in Ningxiu 宁秀/ Nyinshuk ཉིན་ཤུག། township (just ask around – there’s only one hotel in town). If you need to get to Xining (somewhat) rapidly, there is a direct Hor-Ningxiu-Xining bus (departs 7:30am from Hor, 7:50am[ish] from Ningxiu, 8:05am from Batang on even-numbered days). Otherwise, transportation in this area is mainly via small vans and/or hitching. A major transport hub for the region is Batang འབའ་ཐང་། 巴塘 (also called the sancha lukou 三岔路口), a major intersection where roads from Ningxiu, Hor and Tongde (Ba Dzong འབའ་རྫོང་།) intersect the Xining-Golog highway; this is a good place to hitch or get a bus/van in any direction. Not to be confused with the eastern Chinese province, Henan county is yet another vast and beautiful grassland region, but one which holds a unique variety of cultures and landscapes. 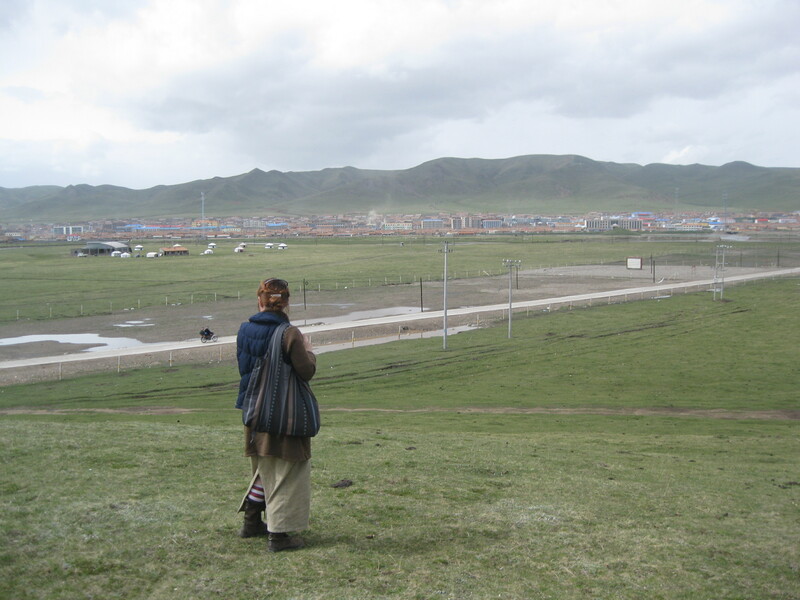 Sitting on the banks of the Ze-chu river, the county town has been modestly redone for tourism to reflect the region’s status as a “Mongolian Autonomous County”. Despite the area being largely Tibetan from a cultural standpoint, the historical (and genetic) Mongolian presence – as well as the Mongolian customs that remain – have justified the construction of fake blue yurts on downtown rooftops and statues of Genghis Khan atop his horse, as well as the usage of Mongolian script (a language which nearly no locals can speak, let alone read) on signs around the region. Warmer and cleaner than Zeku, the county town (3500m) is a pleasant if not engrossing place (though there is a monastery that is well worth visiting located 2-3km east of the main crossroads). However, everything changes each August, when the annual Nadaam (那达木) festival transforms Henan town (and the surrounding grasslands) into a minor metropolis as tens of thousands of visitors roll in for the festivities. And out of town, some truly spectacular landscapes and friendly nomadic communities await exploration. Transportation in Henan is relatively efficient for the region’s breadth, terrain and comparative isolation. Numerous buses, cars and minivans make the trip from Xining and Rebgong each day, passing through Tsekog/Zeku on the way. There are various minbuses and full-size buses to different destinations within the county, including the Yellow River Banks 黄河沿 རྨ་ཆུའི་ཟམ་ཁ། and nearly every remote township. Buses are also available to Linxia 临夏, Xiahe 夏河/Labrang བླ་བྲང་། and Hezuo 合作/Tsu གཙོས། (among other places) in neighboring Gansu. Numerous cheap hotels are clustered around the bus station. There are also a few nicer places, including the Dongfeng Hotel 东峰宾馆 (135/room, including bathroom with hot showers) about 100-200 meters east of the main intersection. If you’re looking to splurge, the Mongolian-kitsch ugly but eminently comfortable Nadam Hotel 那达木宾馆 (expensive) is possibly the best night’s sleep I’ve ever had anywhere. Restaurants are everywhere; the best baozi are just west of the main intersection on the main street, and a particularly good fancy place is located on the 2nd floor of the building on the corner of the main intersection which is on the left as you look uphill (it has the character 醉 zui in its name, which I otherwise forget). As in Zeku, try the rightfully famous mutton and yogurt in this region. Henan county has several “attractions” but all are likely to be quiet/deserted. The Lhamo Lhamtso ལྷ་མོ་ལྷ་མཚོ། (Ch: Sheng Hu, 圣湖) is a small spring-fed sacred lake that, these days, is choked with the refuse of countless offerings. However, there is another sacred lake located in the extremely rugged mountains which lie south of the main road to Serlung གསེར་ལུང་། (赛尔龙) township – a beautiful region to explore in itself, or as part of a trip onwards to Labrang or Luchu in Gansu province (buses usually available). 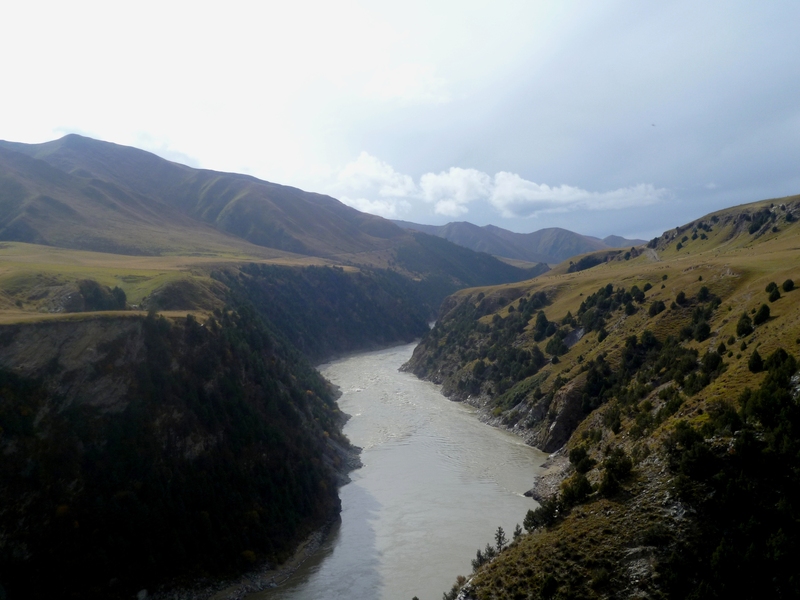 Equally if not more beautiful are the regions along the Yellow River in the southern part of the county, where the great waterway carves its way through some massive mountains, vast grasslands and deep limestone gorges. If the facilities were available, this would be some fantastic rafting/kayaking. Southcentral and southeastern Henan retain more Mongolian cultural elements, not to mention some mindblowing scenery and backdoor routes to Machu, Taktsang Lhamo (Langmusi), and, adventurously, Jigdril/Nyenbo Yurtse in Golog. 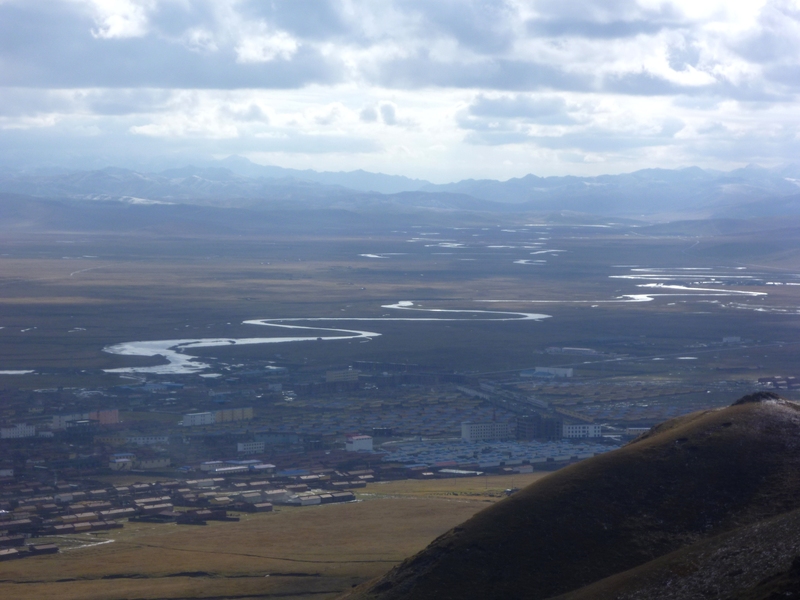 The southwestern part of the county, in contrast, is traditionally part of greater Golog, and many people here are resentful of the county’s identity-change, feeling more connected to Golog Tibetan culture than the Mongolian identity proclaimed on their ID cards. 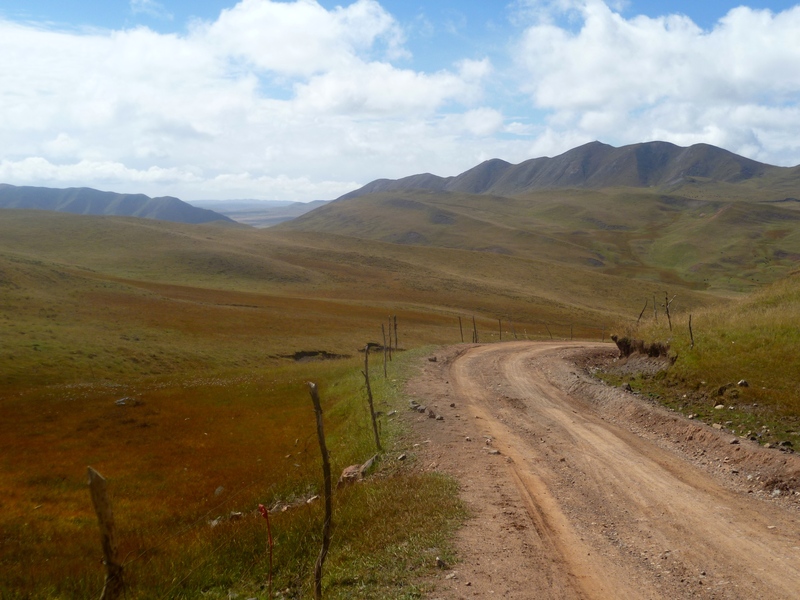 Rough roads lead from here to the Golog towns of Machen/Dawu and Ragya through (of course) more spectacular scenery.